In between building the future rabbit colony housing, I’ve found time to make a few decorative improvements to the garden. 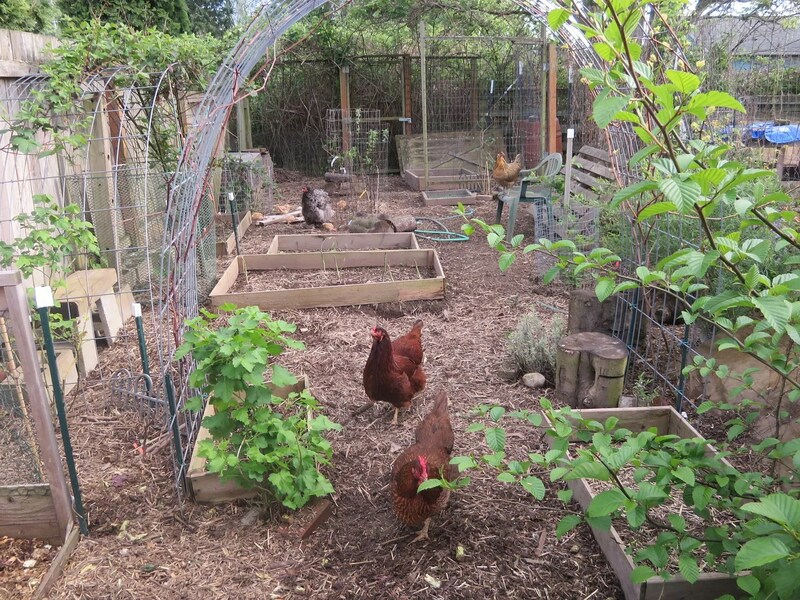 Over the last year, I’ve been adding more and more food-producing trees, shrubs, and plants to the chicken’s yard. And finally, it’s beginning to green out. 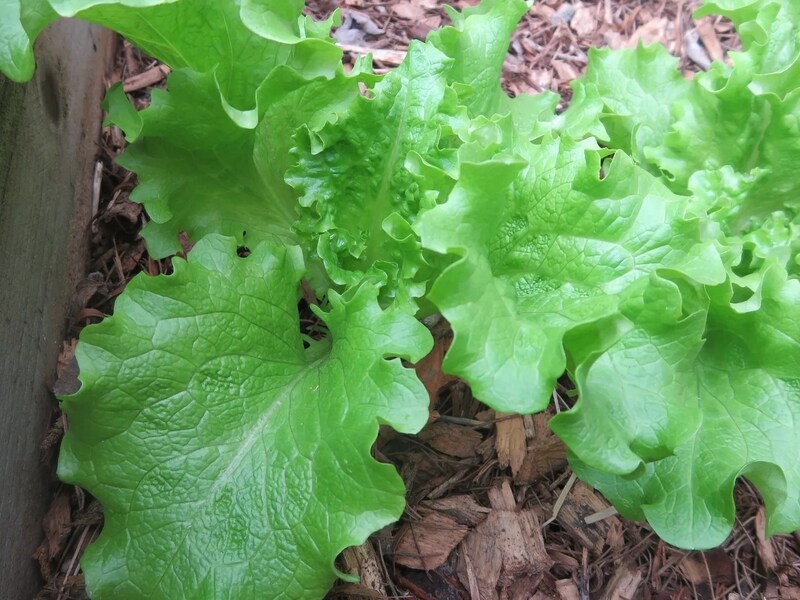 They will have blackberries, jostaberries, seaberries, mulberries, apples, currants, grapes, roses, oregon grape, and various other plants and herbs. I’m also working on building them grazing beds, with edible greens underneath. 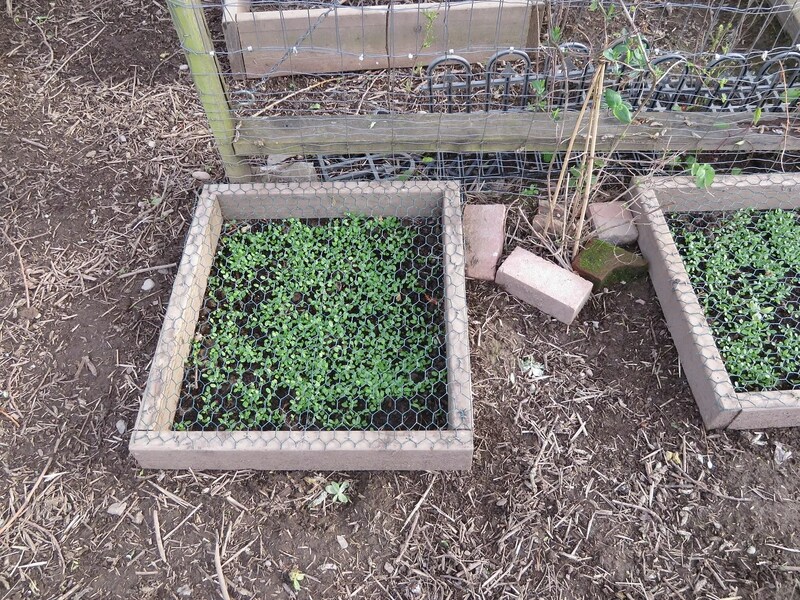 These two are planted with red clover. once the greens grow up high enough to reach up to the wire, the chickens will be able to pick at them – without being able to kill them by either digging or over-grazing. I need to get more finished, with kale and wheatgrass, and other tasty things. The south facing stone patio next to our house, while wonderfully warm in early spring, is way too hot at the height of summer. 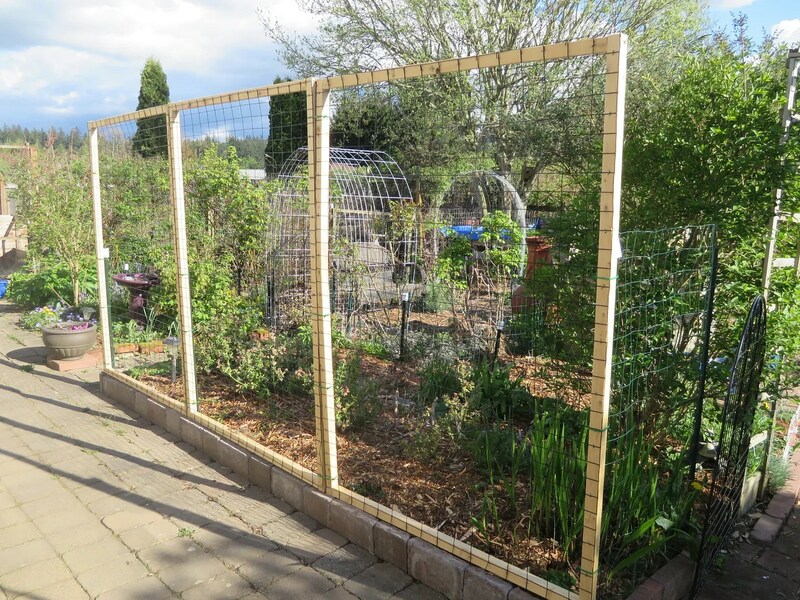 To cool it down a little, I’ve built trellises, and plan to grow green beans up them to provide food and a little shade. 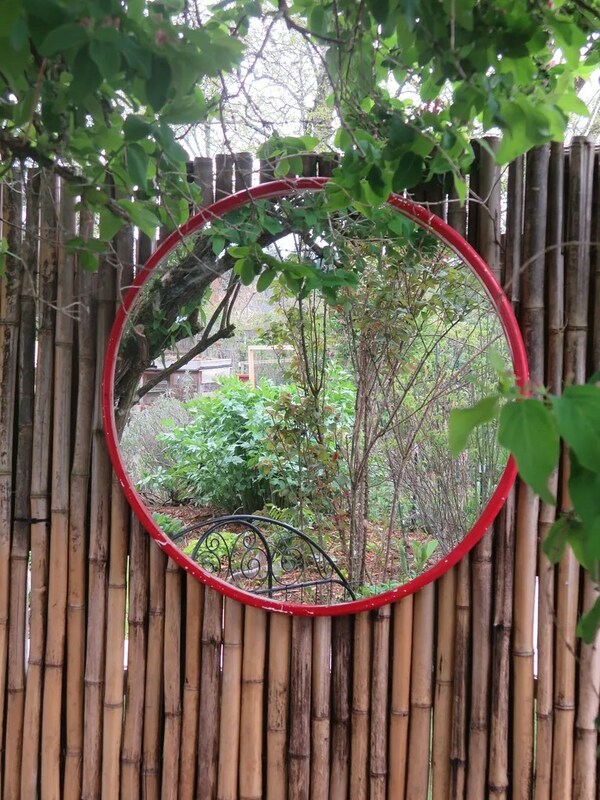 And my personal favorite, that makes me happy every time I see it: a mirror, at the end of one of the garden paths! It adds the illusion of more space, and more life to the garden. I wish these pictures could fully capture it. Spring is such a wonderful time of year. Green is such a lovely color, after all that winter…. 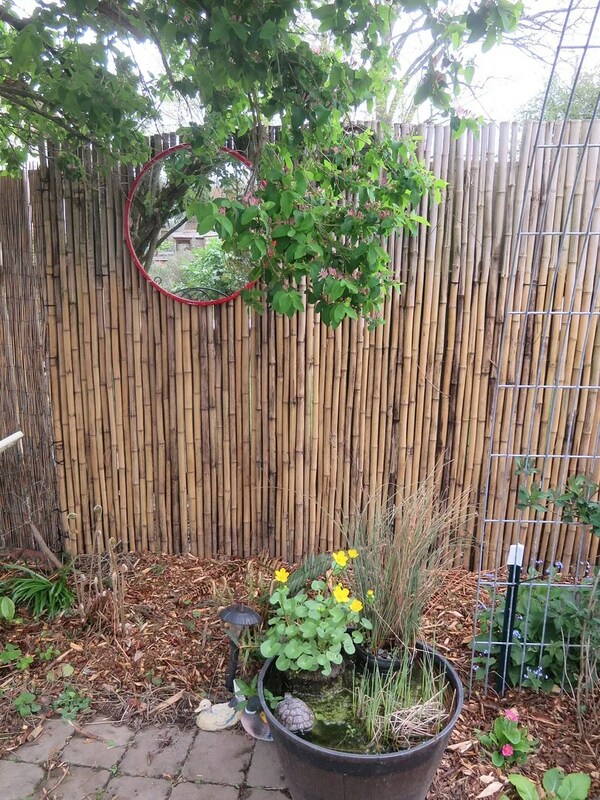 This entry was posted in chickens, Gardening and tagged chicken run, garden, garden mirror, plants for chickens, trellis. Bookmark the permalink. Looking great! You should give lentils a try for chicken greens. They grow fast, have nearly a 100% sprout rate just from the cheap grocery store bags of cooking lentils. My chickens loved them. Thanks for the tip! I hadn’t considered lentils.